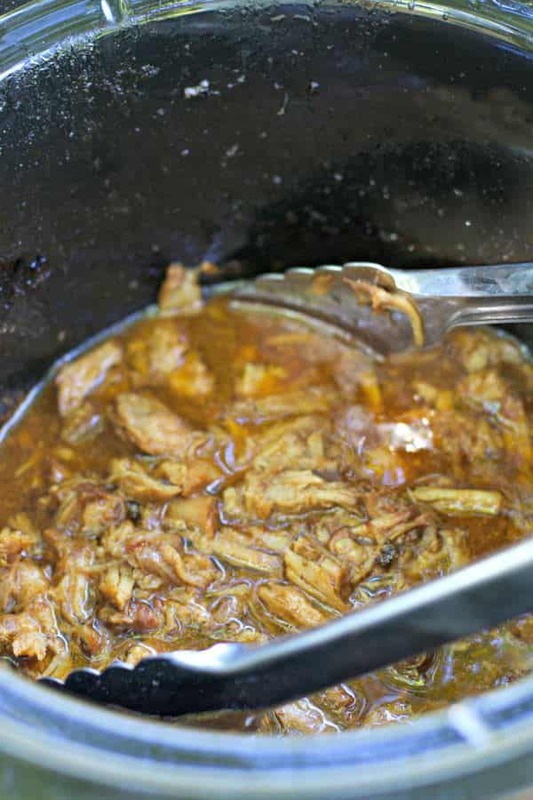 I made this Slow Cooker Root Beer Pulled Pork while camping this last week. The first time I ever heard of this recipe was when I was working 12+ hours a day at the River Road Post office during Christmas season as a clerk. Have you ever met someone that you immediately hit it off with? That is what happened with me and Val, we worked every morning together starting at 5AM sorting packages, magazines and putting mail in the box section. Though the working conditions weren’t the funnest, Val would make the best of it by cracking jokes all day, nearly having me in tears I would laugh so much! Val and I are both big eaters, so everyday we would plan what we would be making for lunch together, when you start at 5AM, lunch is actually at 9AM, not the healthiest lifestyle I do have to say. One night after work Val pulled out her crock pot in the break room and showed me how to make Slow Cooker Root Beer Pulled Pork, I thought she was crazy, she was going to cook this pork overnight at the post office! She plopped in a pork shoulder, and here is what her exact recipe was: A couple glugs of root beer and a couple squirts of barbecue sauce, cook on low for 12-15 hours. Of course Val had to make glugging and squirting noises as she was explaining the recipe to me. What was the result? The most tender pork I had ever tasted at 9AM in the morning. Though I don’t cook my pork as long as Val does, this still turns out perfectly tender in 8-10 hours. If you missed last week’s recipe, it was another recipe from camping, Beanies and Weenies in the slow cooker. We are headed out next week for more camping! 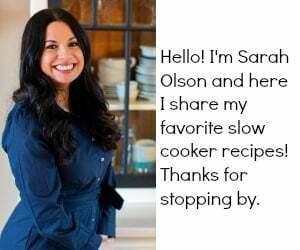 I think I am going to try a few more slow cooker recipes while we camp again, because truthfully, I hate cooking while I am on vacation and somehow slow cooking doesn’t feel like cooking to me. Have a great week! 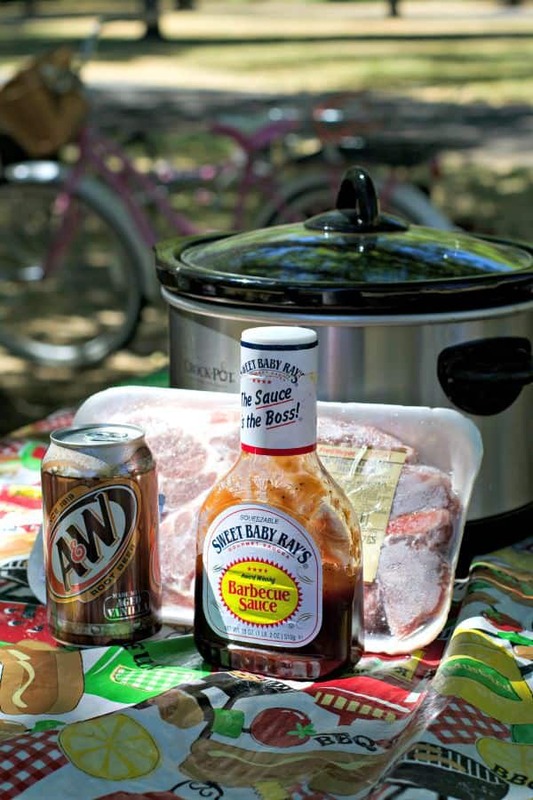 In a 4 quart or larger slow cooker, add the roast, root beer and barbecue sauce. Cover and cook on LOW for 8-10 hours, without opening the lid during the cooking time. Take the roast out and shred, discarding any fatty pieces, put the shredded meat back into the sauce that is still left in the slow cooker, stir and serve on buns. 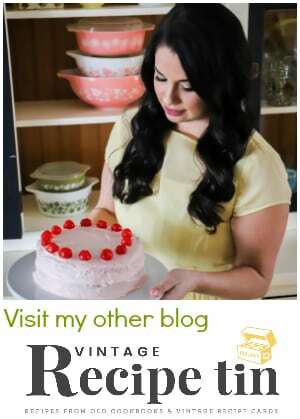 I love how easy this is and will be making this very soon! I also wish I was sitting around YOUR campfire! I love how easy this is too. 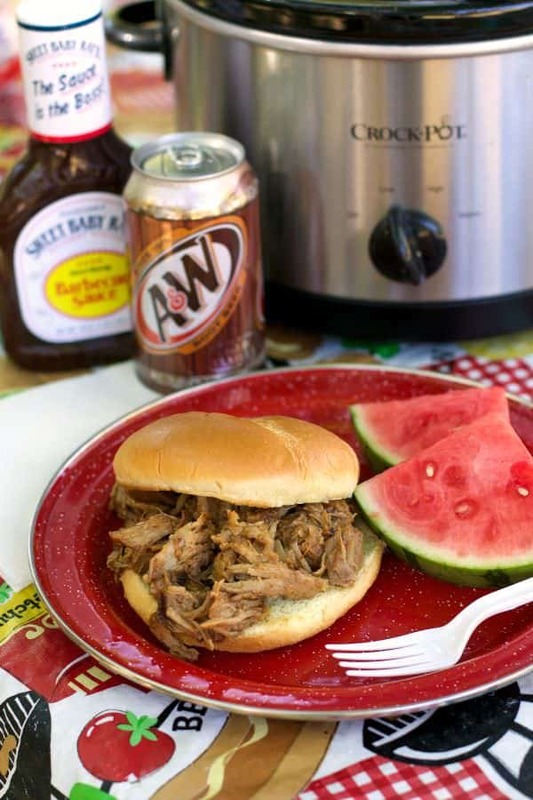 I’ve made similar pork in the slow cooker with Coke, but never root beer. Sounds so delicious I need to try this! 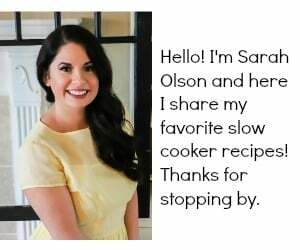 Recipes like this are my favorite kind of slow cooker recipes! Looks so delicious, Sarah! That sure couldn’t be any easier and Grampy loves pork! Thanks Sarah! Should you defrost pork b4 so cooking or just add extra time? hii Can I substitute it with chicken breast? I don’t see why not. Actually would be good! Let me know how it turns out. Can you use this recipe and cooking times if I don’t have a slow cooker. I have a Le Creuset pot. I was just worried about it running dry in 8-10 hours with the root beer/bbq sauce quantities. Any thoughts? Hi Caroline! I used to cook my pork in a le creuset before I got into slow cooker. I remember using this recipe of Jamie Oliver’s. I think 8-10 hours in the oven may be too long. http://aplateofgoodfood.com/slow-cooked-beer-braised-pulled-pork/ I don’t know how the cooking times would work with this root beer recipe though. 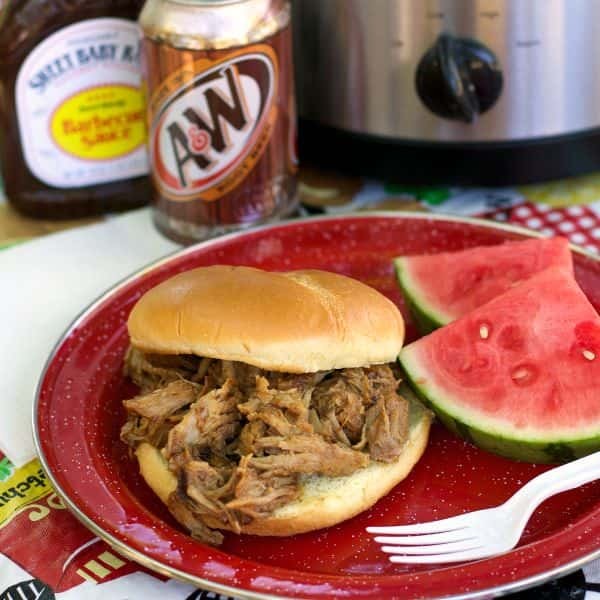 Perhaps try searching for oven root beer pulled pork and find a similar recipe. Sorry I am not too much help. Is it possible to make it “plain” and slow cook it in only the root beer, not the bbq sauce? My one daughter prefers to top hers with ketchup instead of bbq sauce 🙂 I wouldn’t want to risk the pork being dry though. Yes Laura that would work fine, I would season the pork a bit with salt, pepper and onion powder. 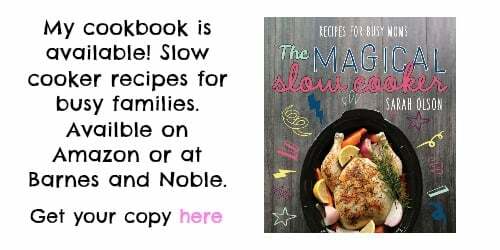 Or if you make this recipe as is with a large pork roast, if you pull the roast out on to a plate, and shred it there, there won’t be much sauce on it at all for your daughter. Would you add veggies in with the meat or cook them separately? I like to throw everything in the pot together but I am not sure about rootbeer soaked veggies. Thanks. If you have a glass Pyrex dish you can put the veggies in that off to the side, tossed in oil. Veggies only need about 3 hours though. This was absolutely delicious! Our family will definitely be having it again! Can’t it be cooked on high? How long if so? I think pork needs a long time, even on high. I would do 6 hours on high. Thank you for responding! Anxious to see how it turns out!